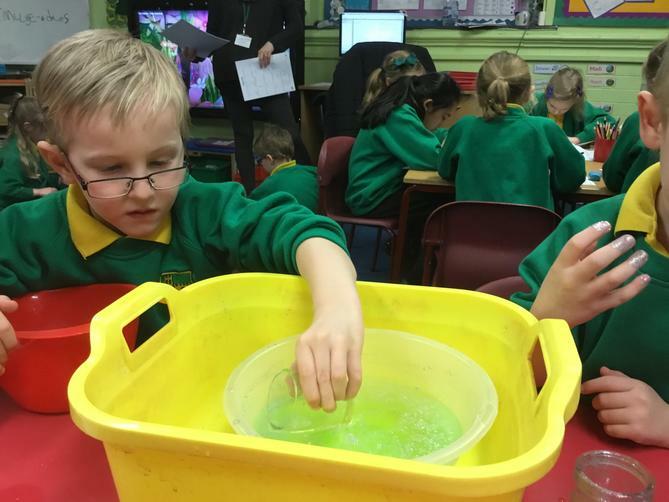 We have enjoyed learning about A Midsummers Night Dream this week. 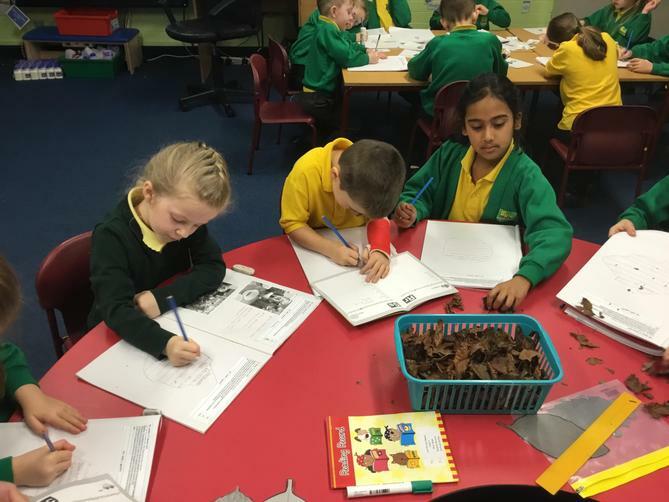 This week has been all about A Midsummer's Night Dream, the children have enjoyed listening to the story and doing work based on it. 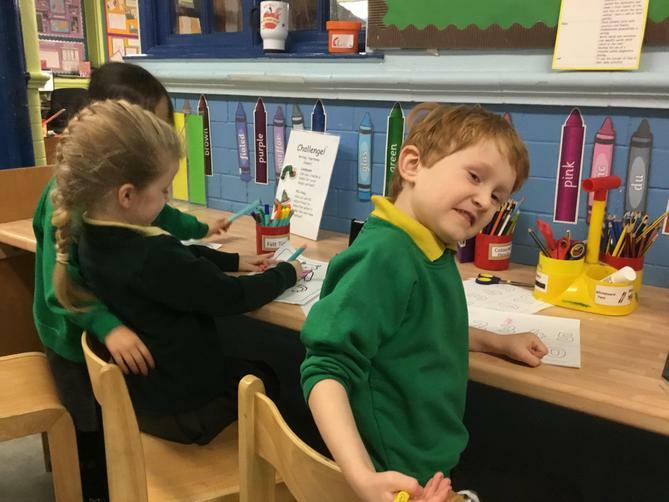 In language we have been finding our favourite characters and describing them. 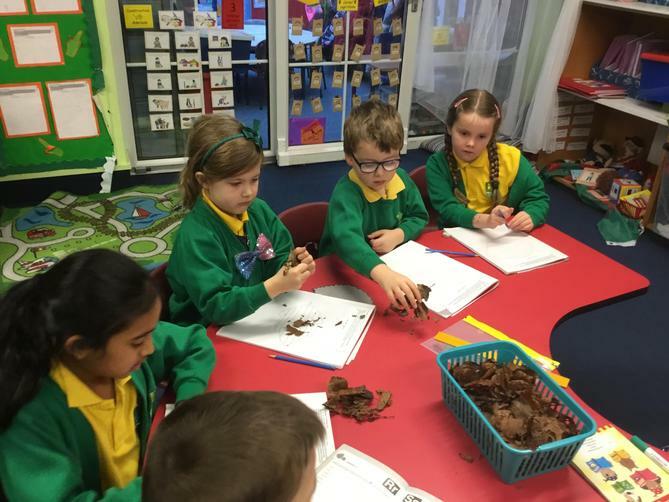 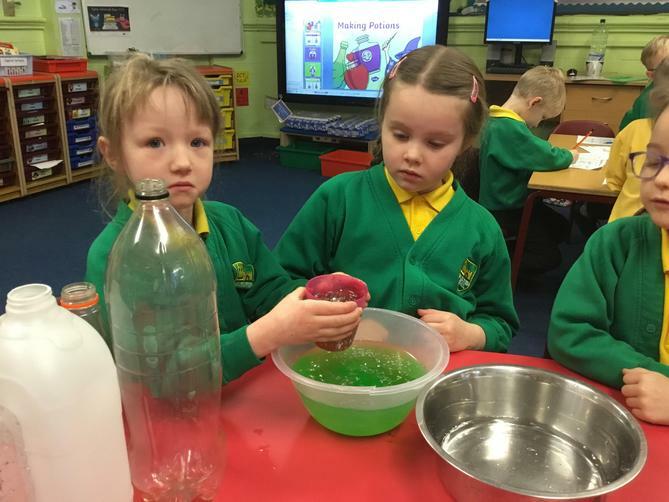 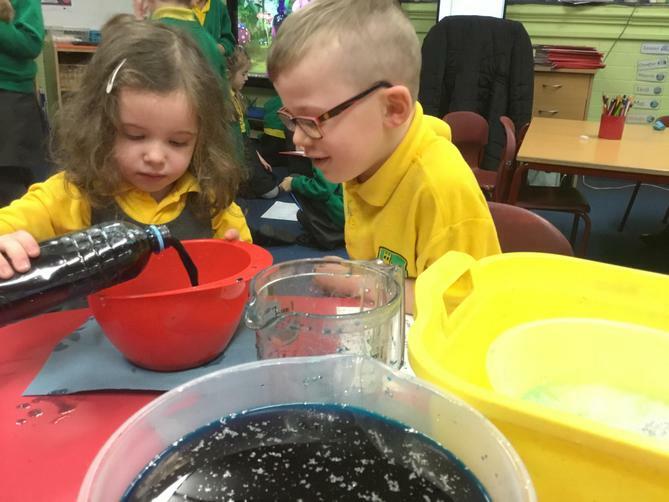 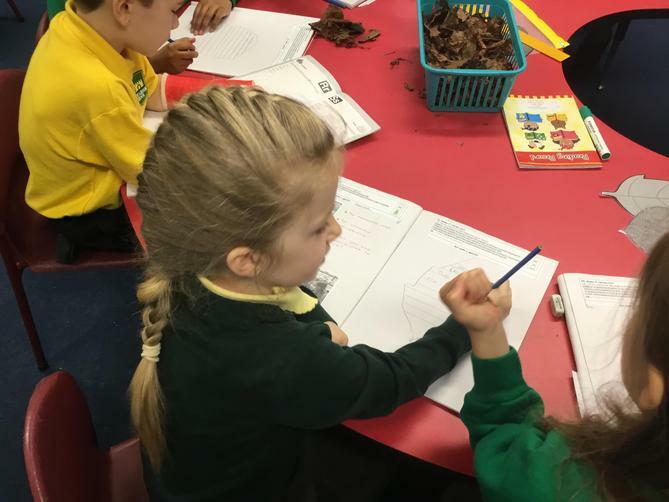 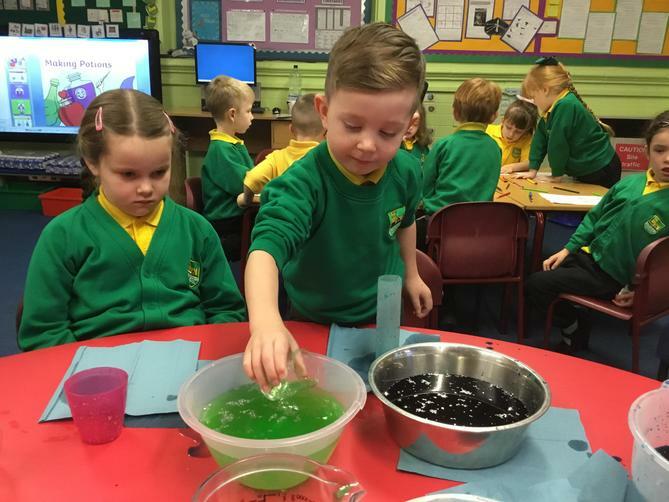 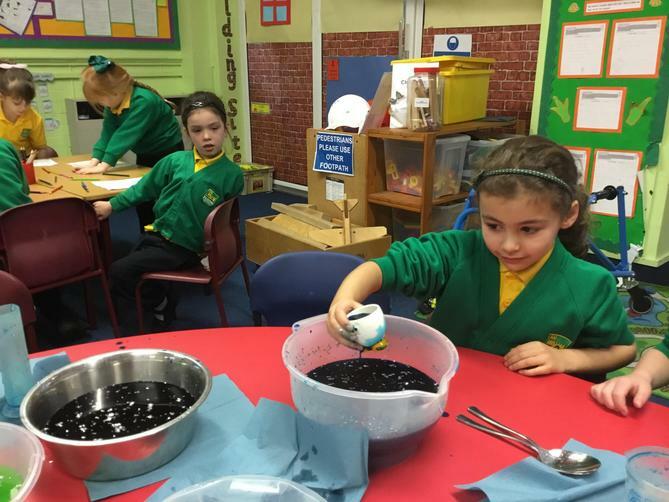 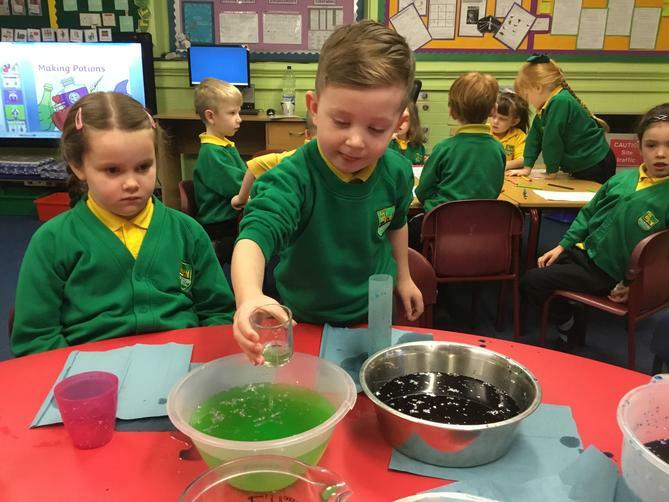 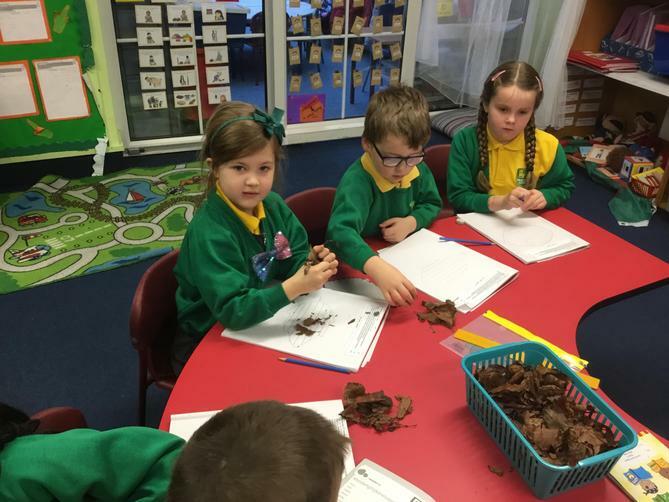 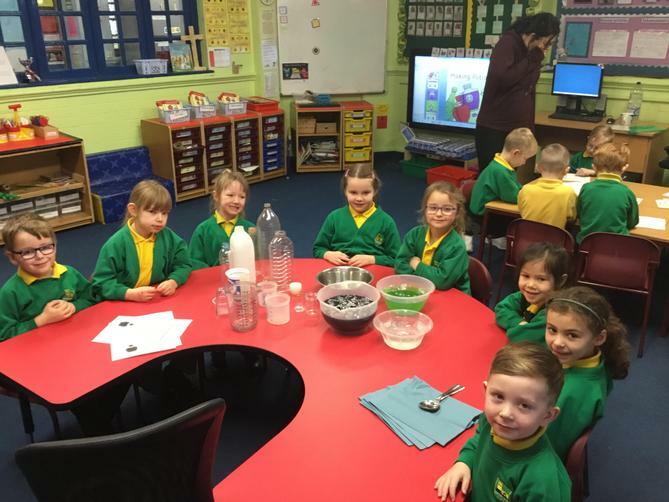 We have been making our own magic potions and writing shape poems about the forest in the story. 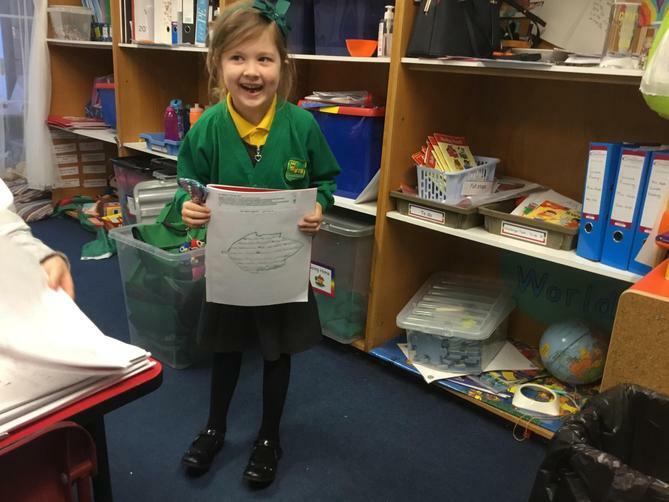 The children have done a really great job and have wrote some lovely poems! 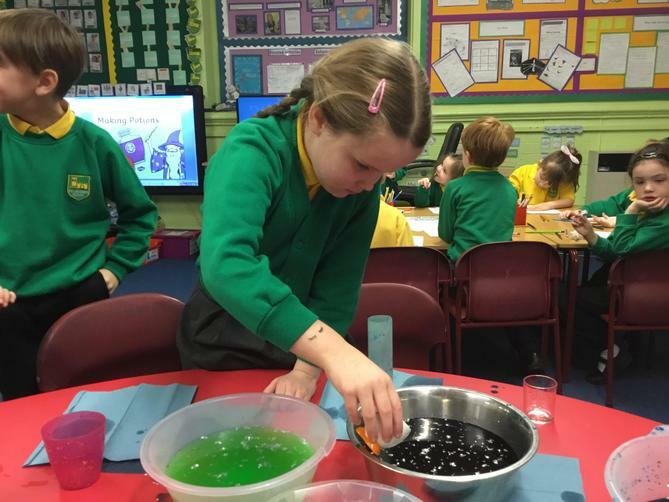 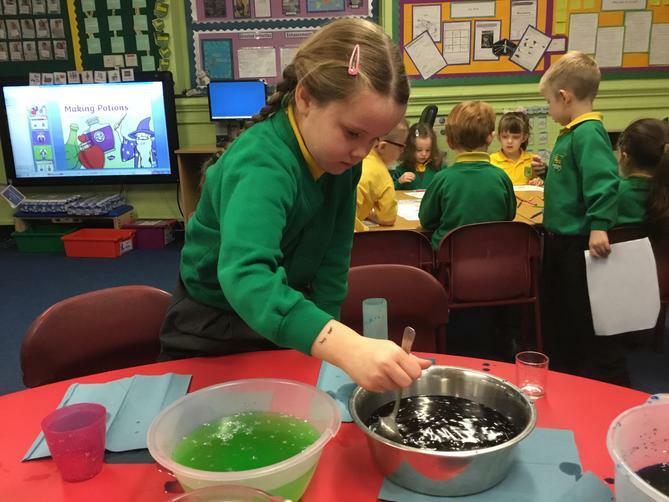 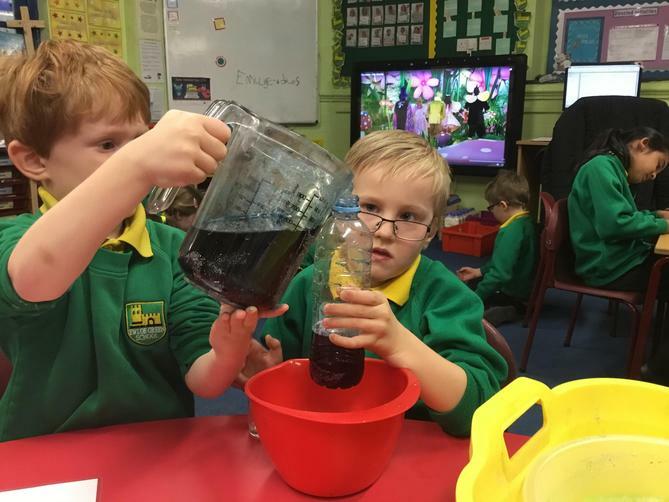 In math's we have been learning about capacity and following a magic potion recipe. 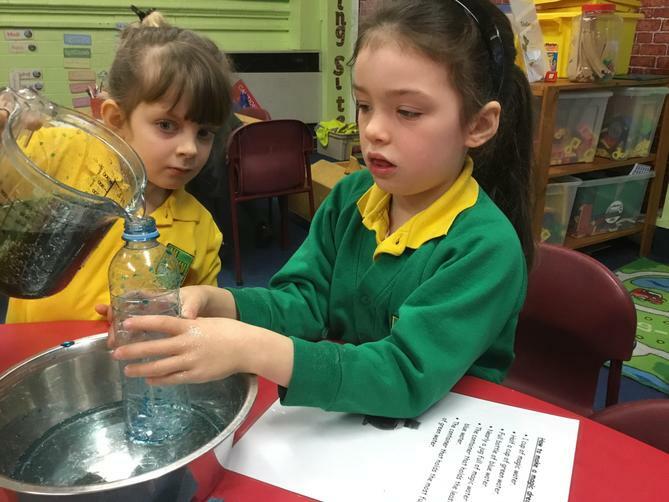 We have thought about the language full, half full, almost full and quarter full. 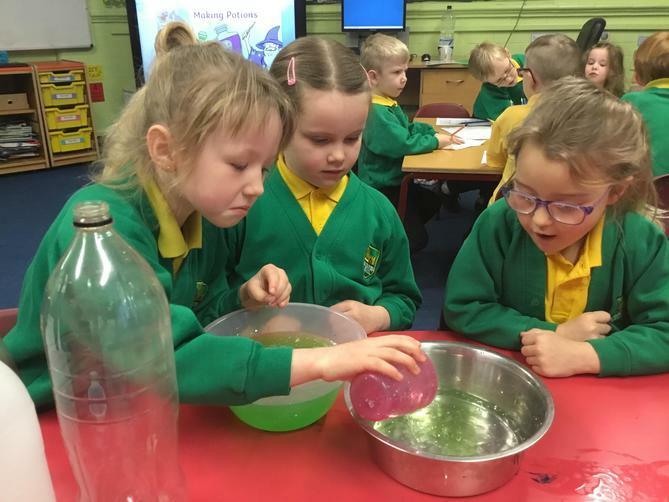 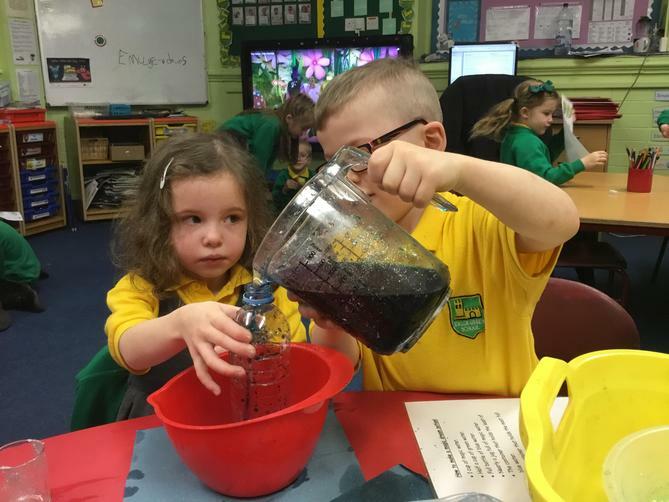 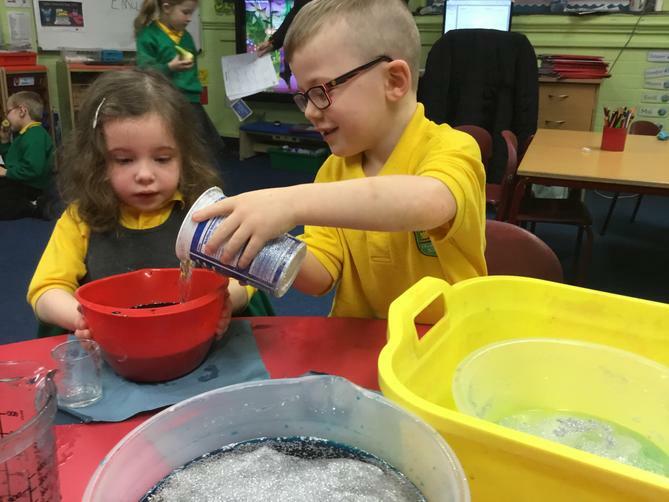 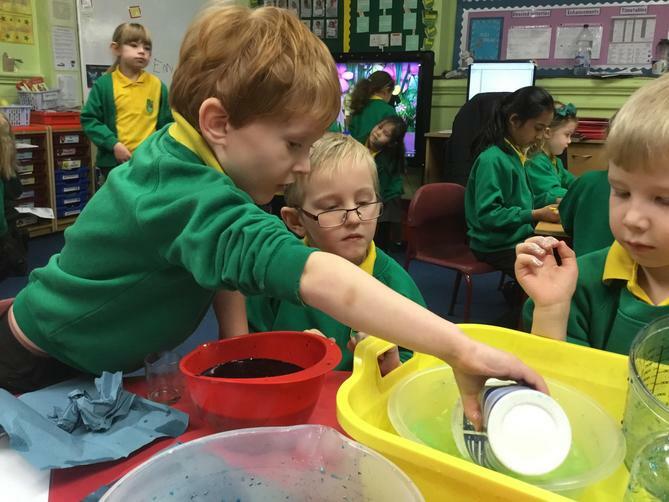 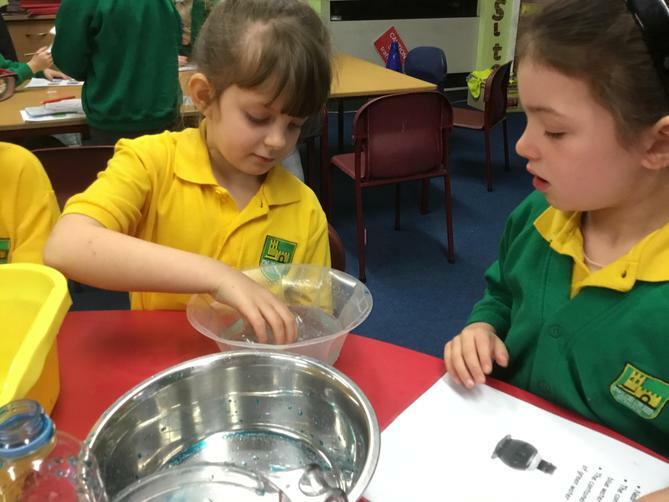 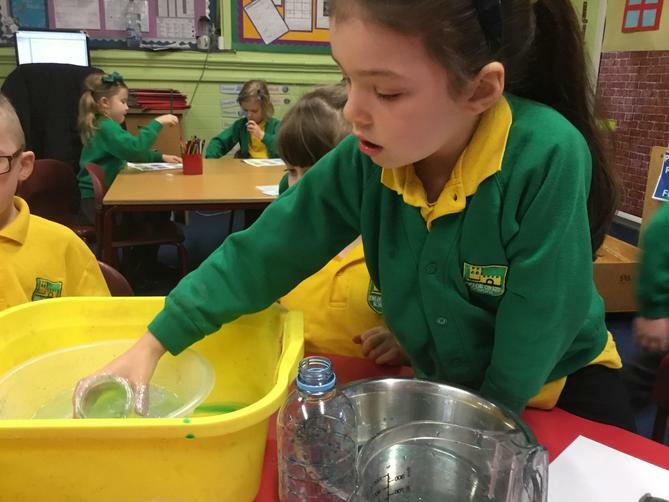 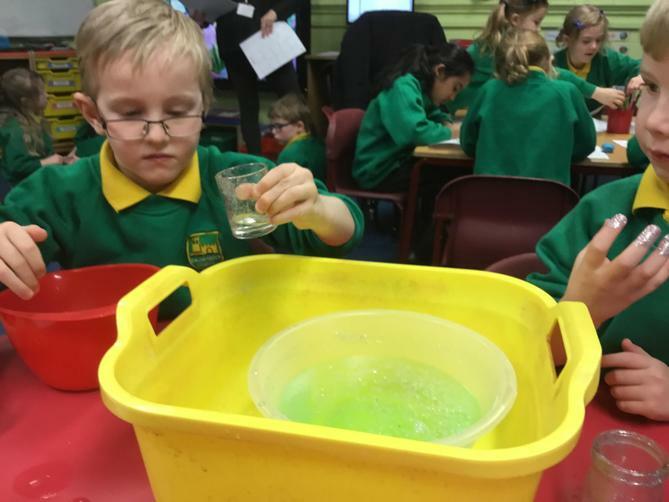 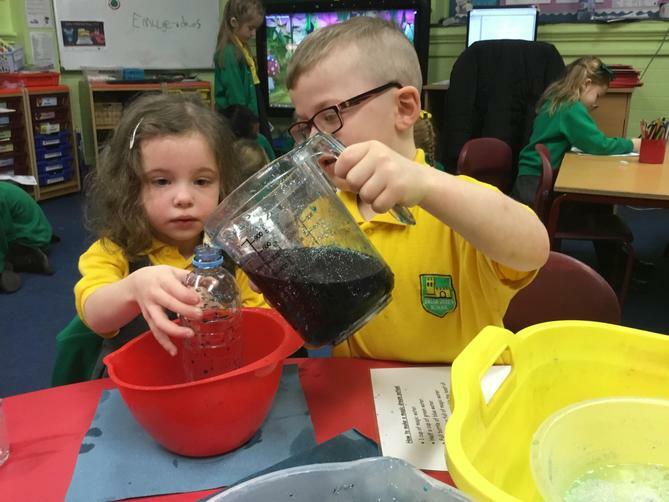 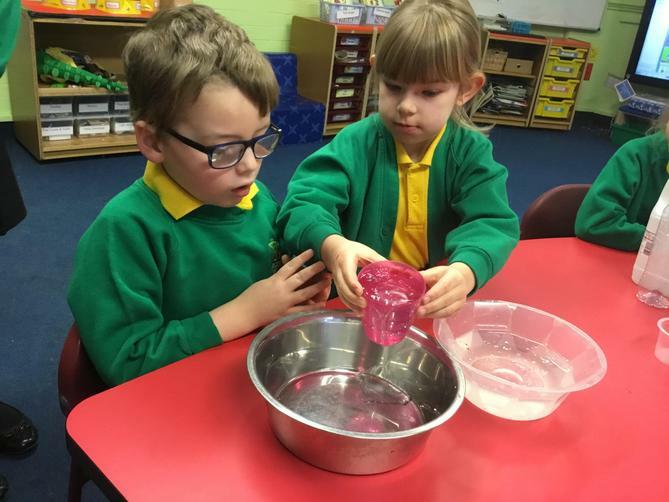 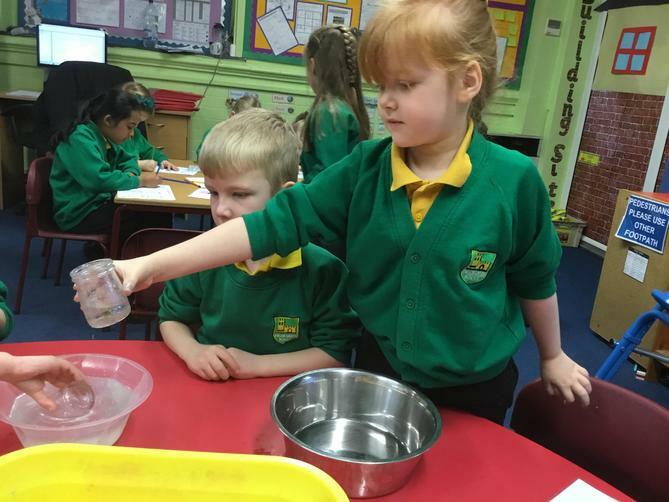 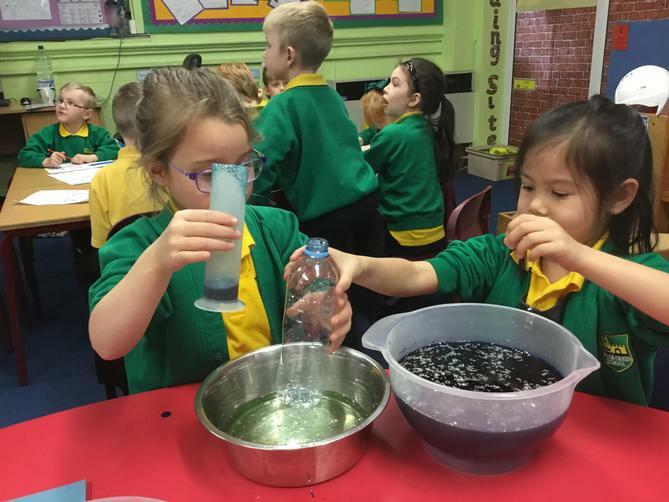 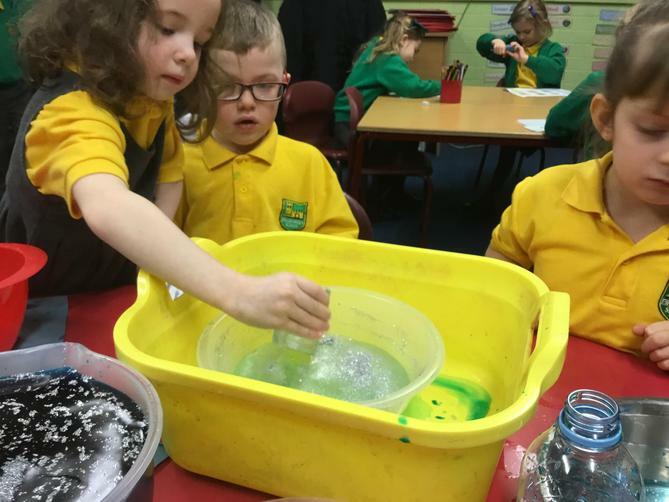 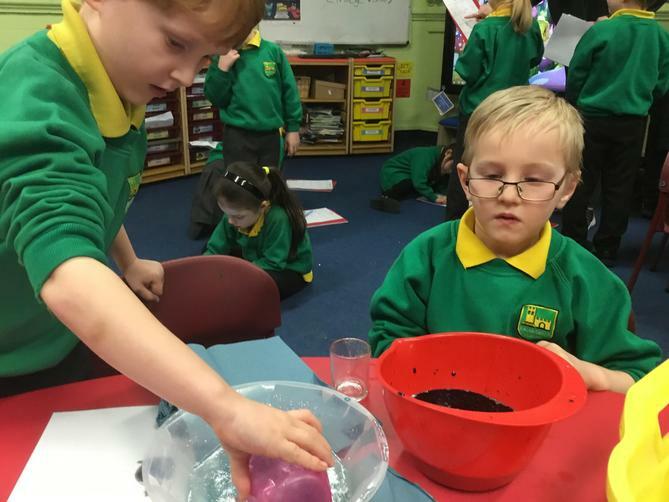 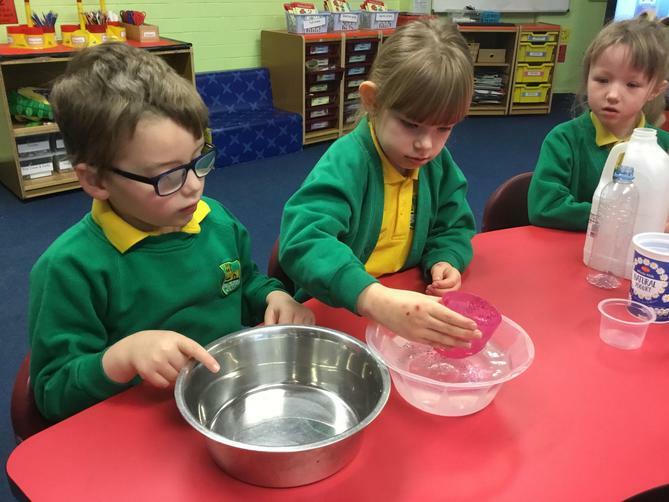 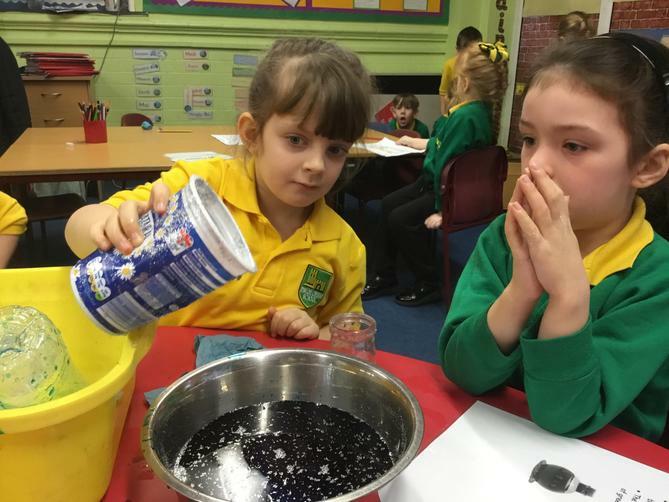 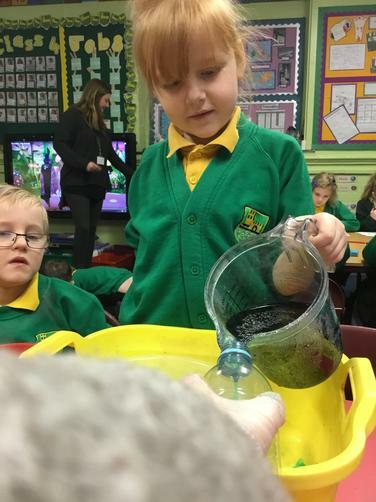 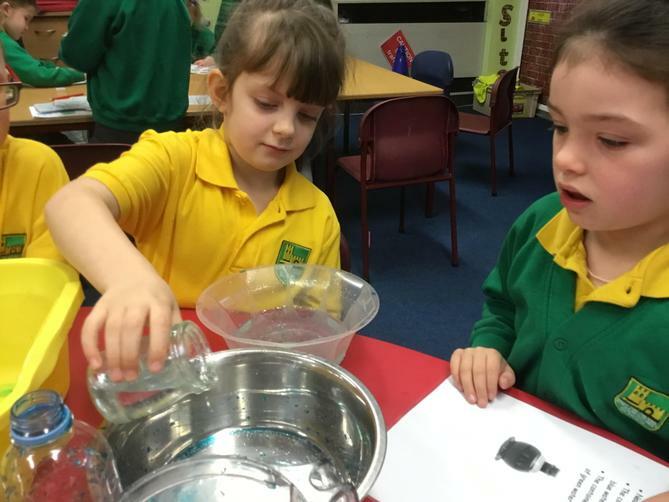 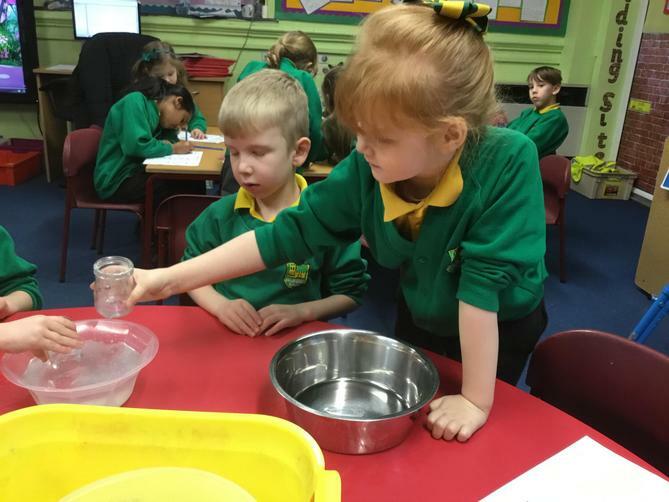 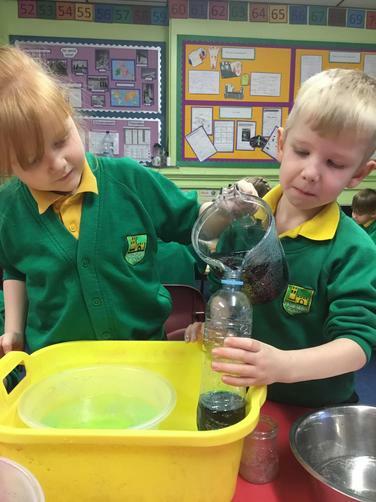 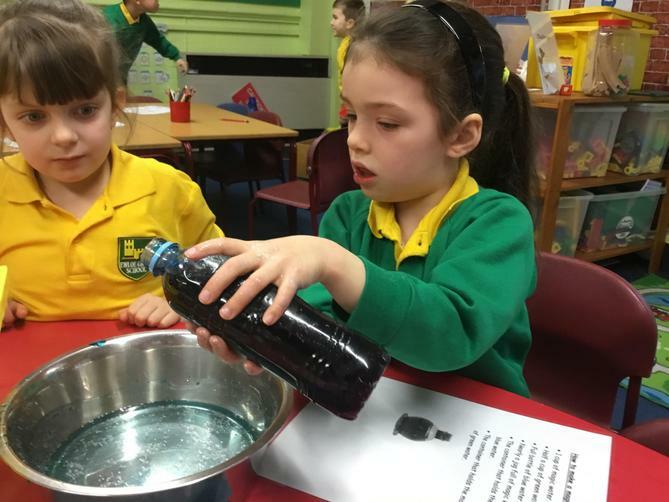 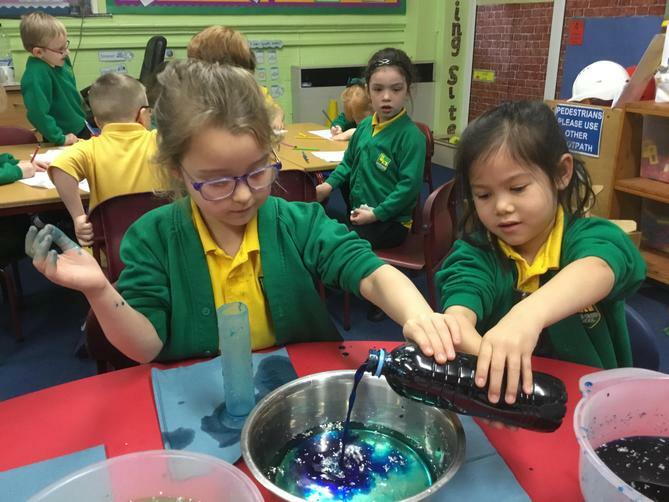 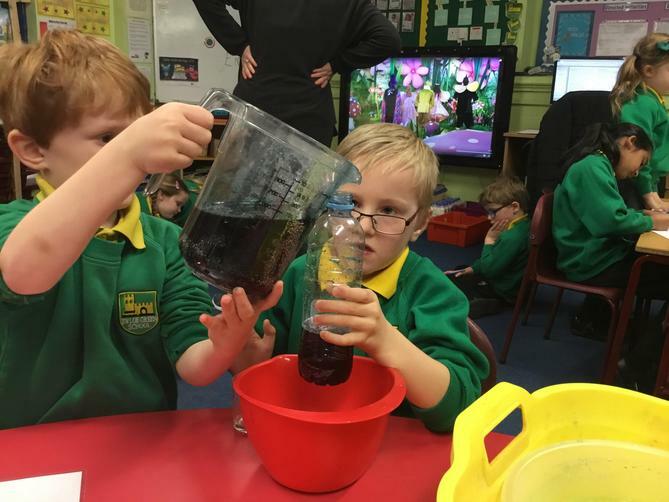 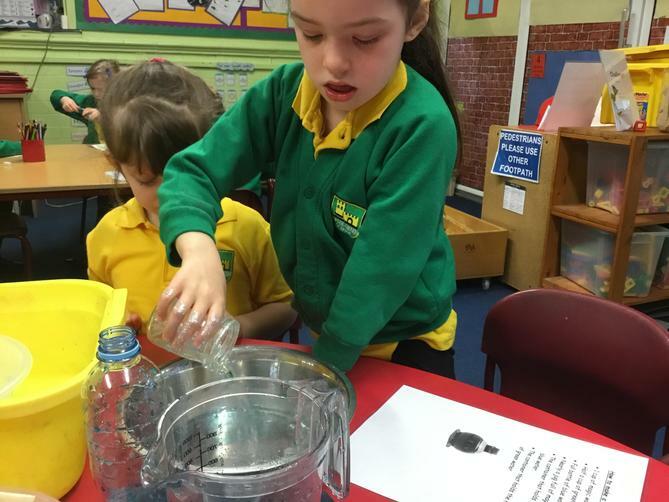 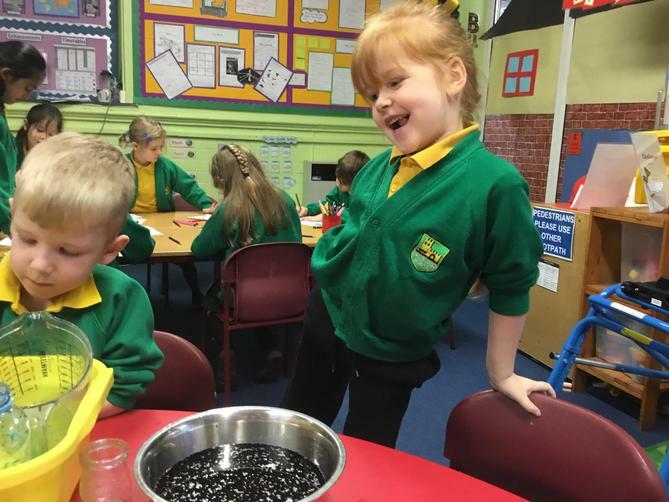 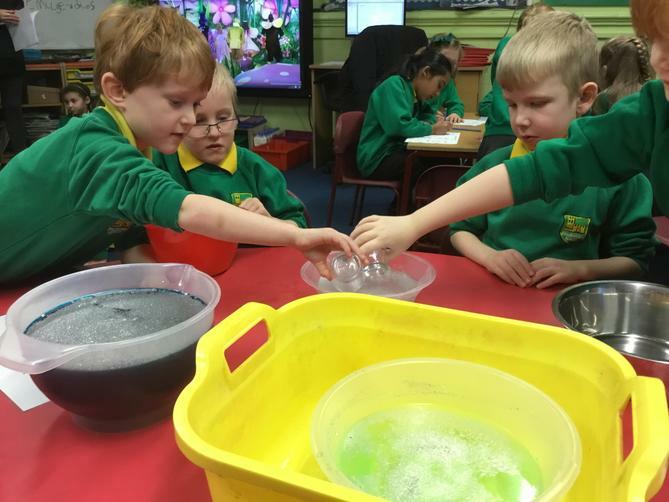 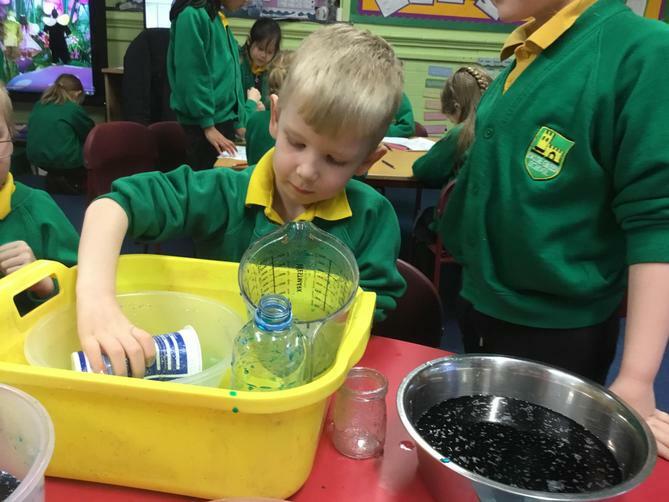 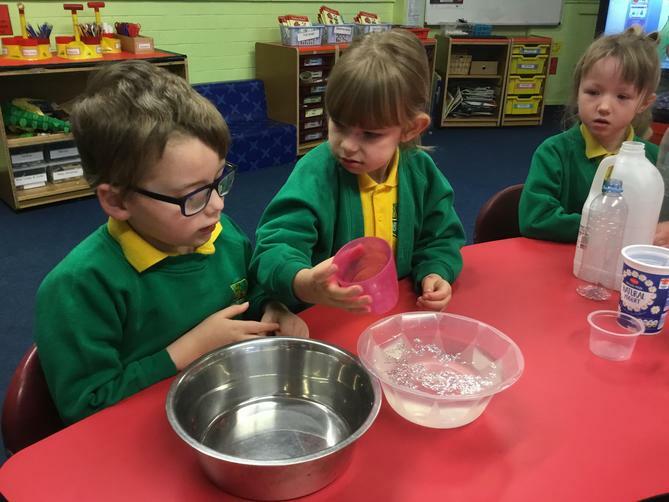 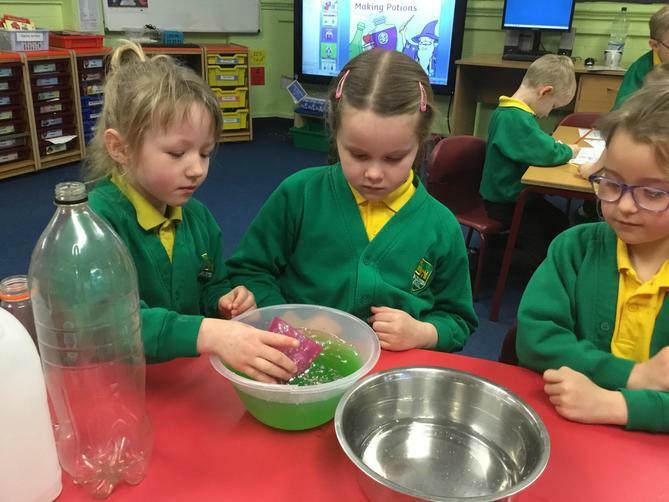 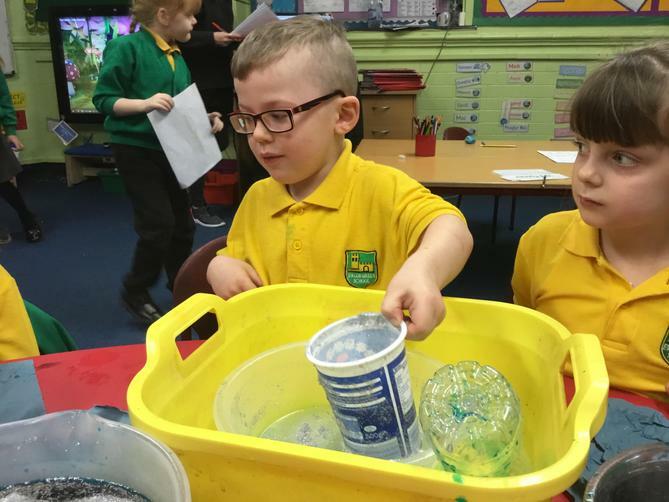 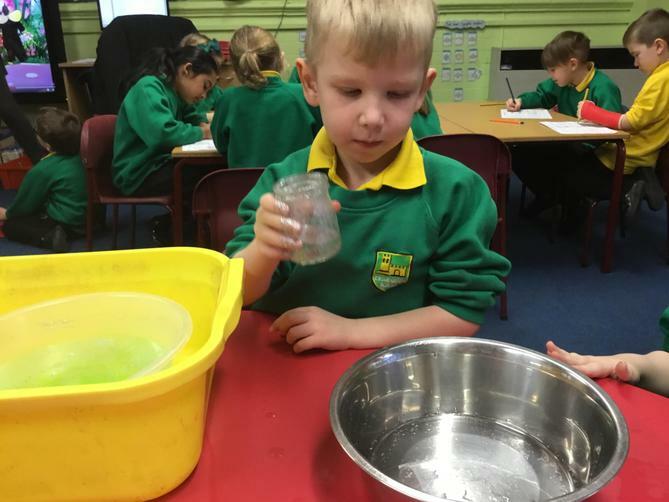 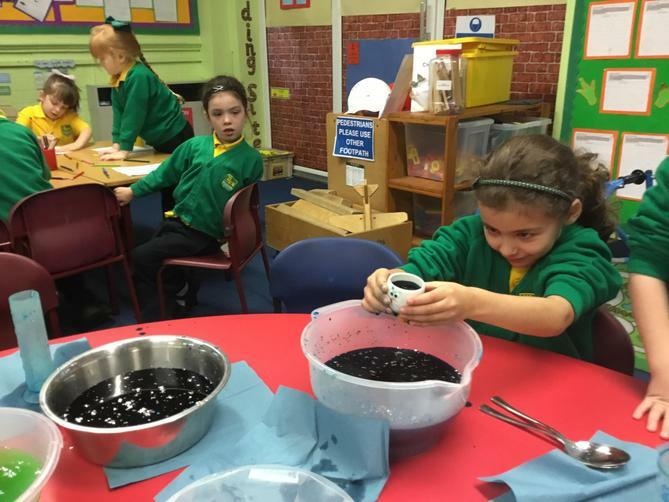 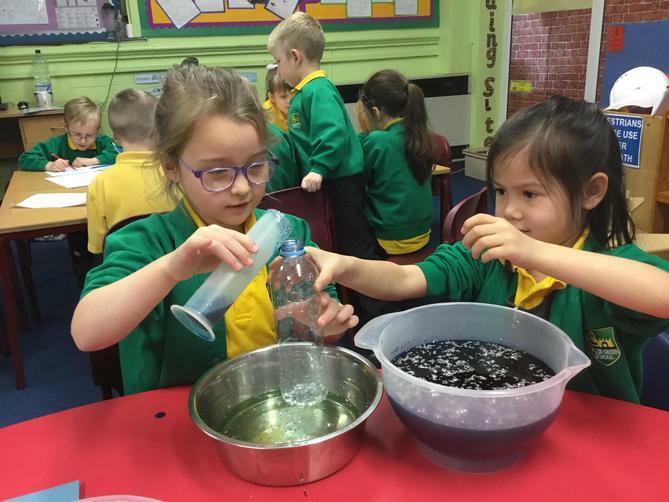 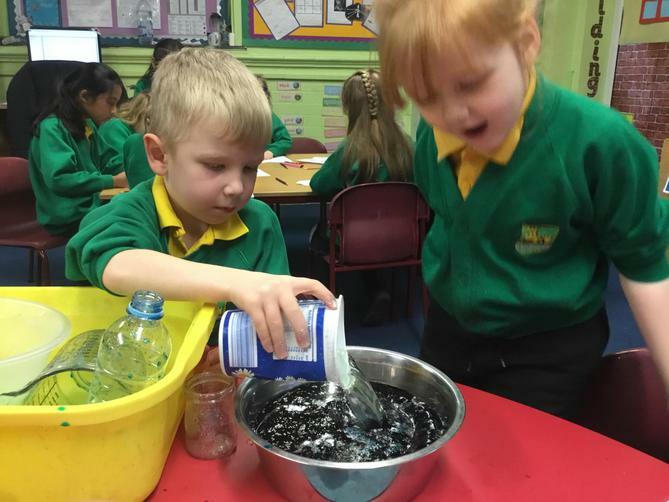 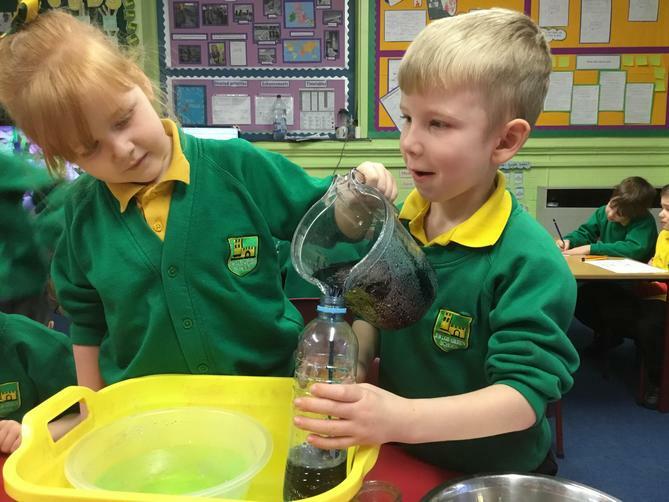 The children investigated how much liquid each container can hold. 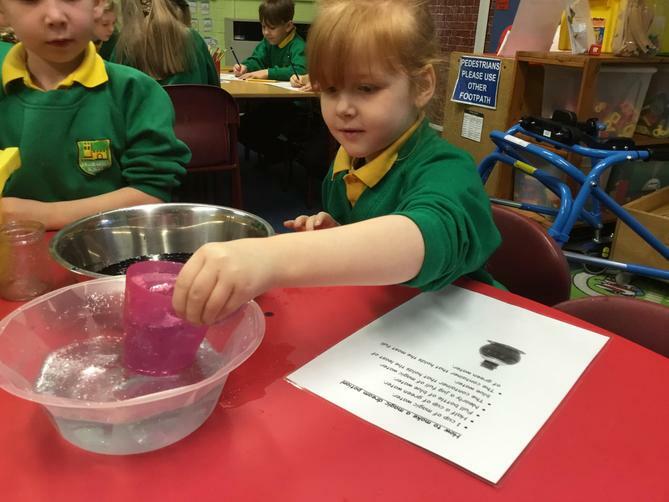 We also did some problem solving in the water area with Mrs Selby! 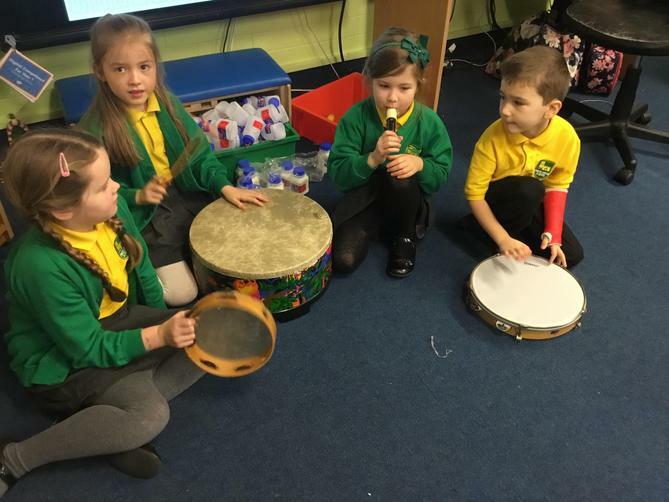 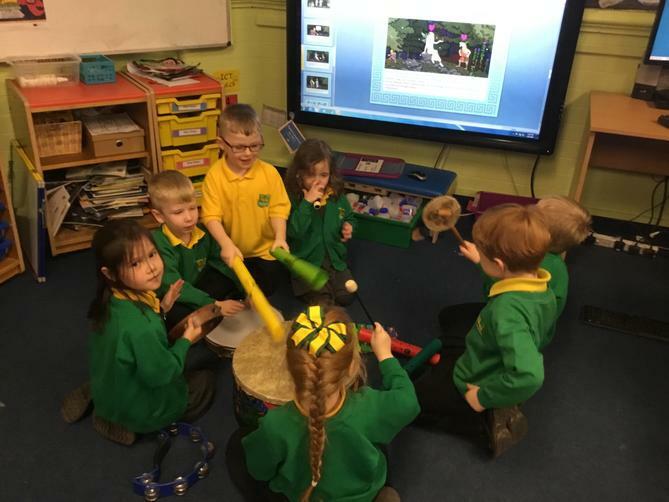 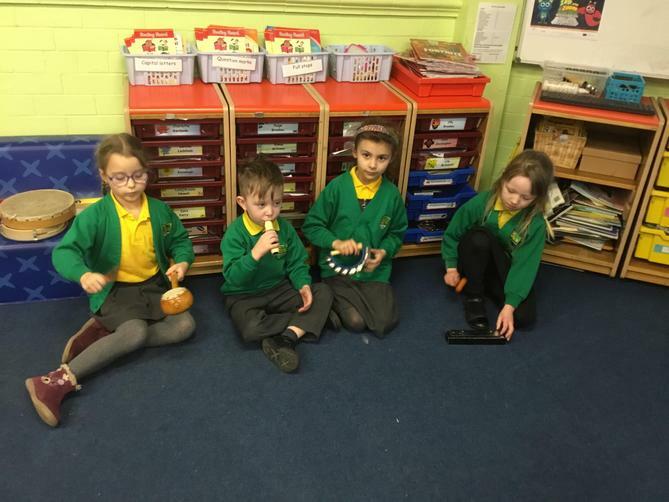 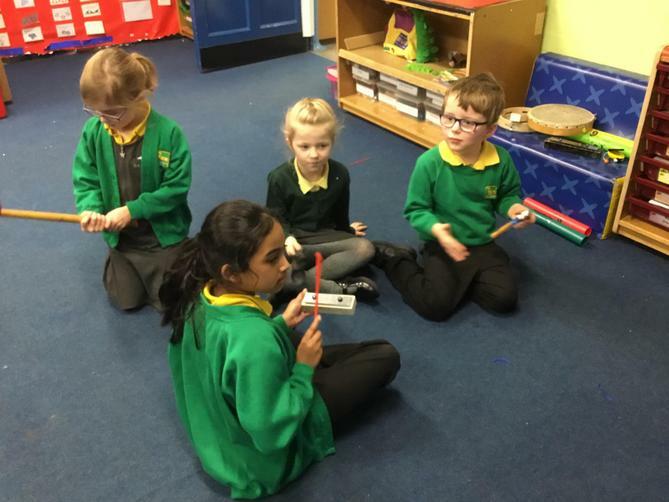 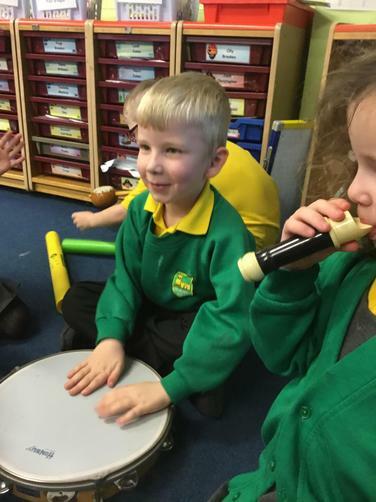 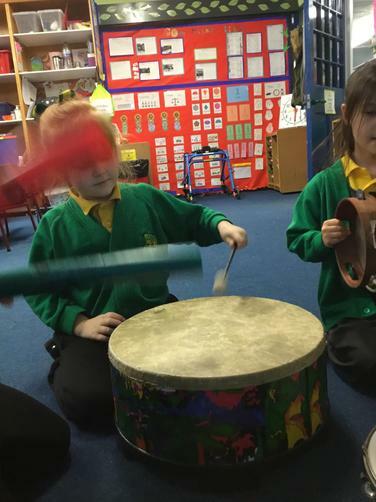 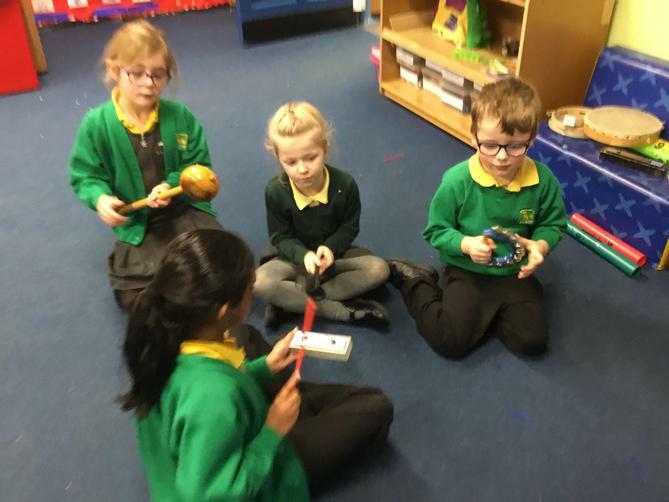 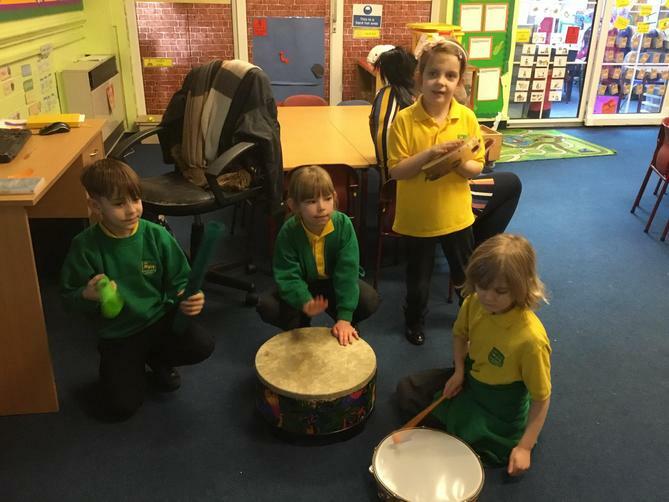 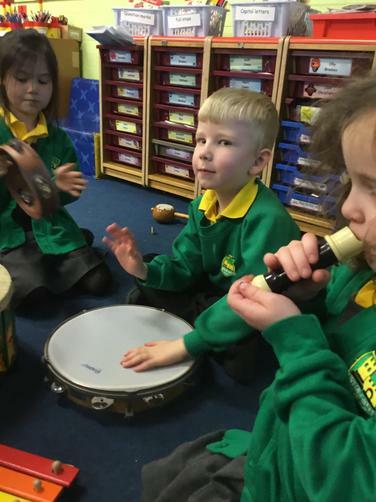 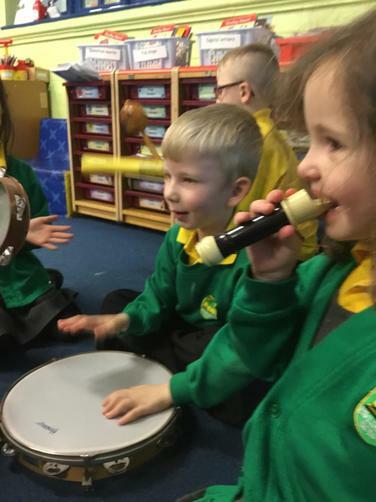 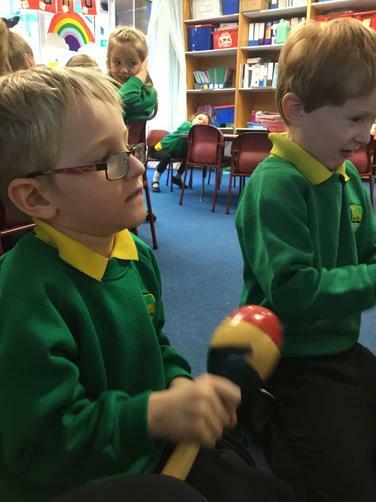 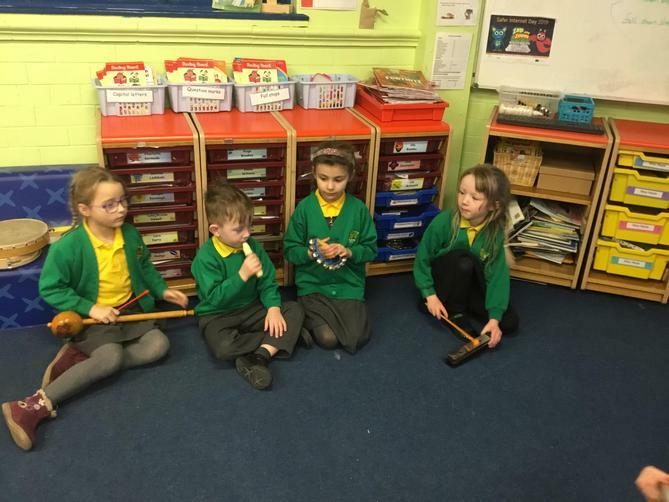 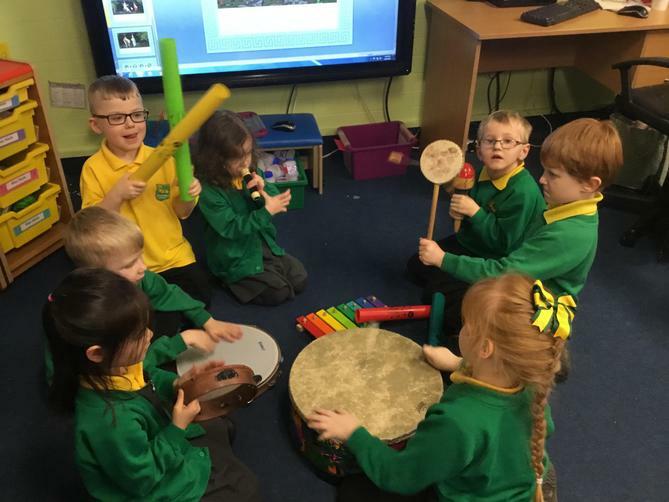 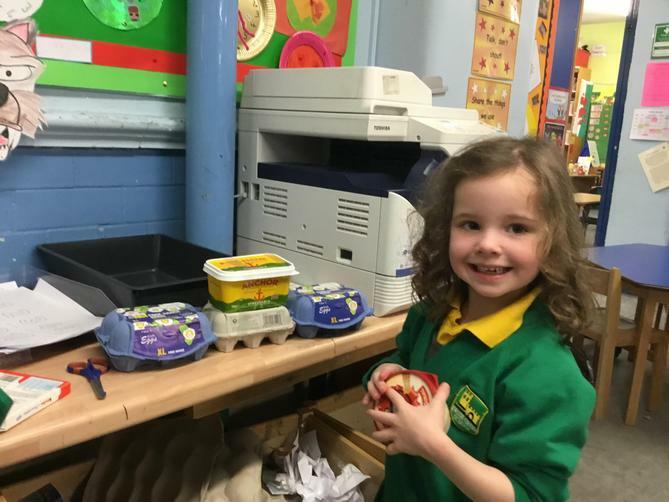 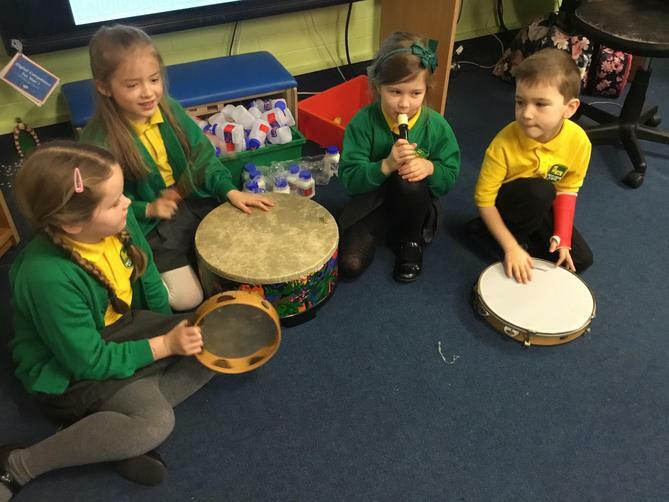 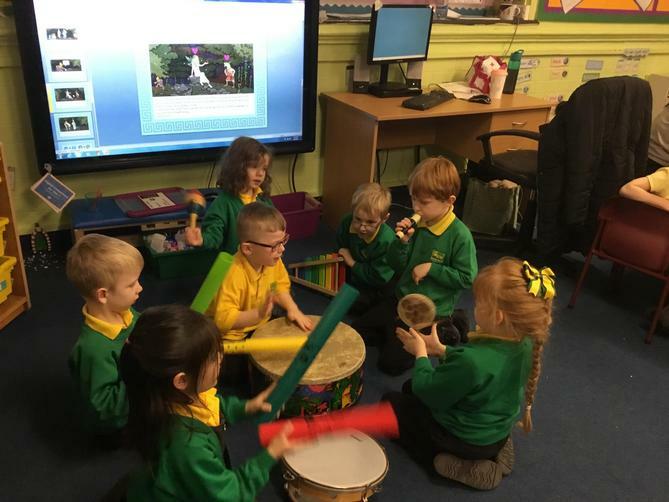 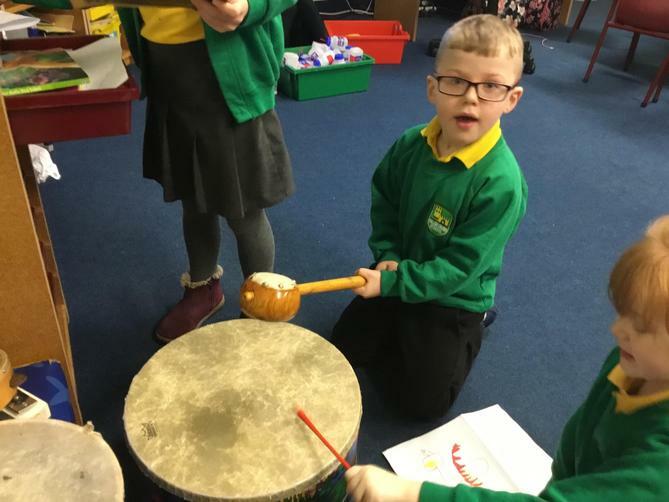 In topic we have been getting the musical instruments out, the children made music to accompany parts of the story. 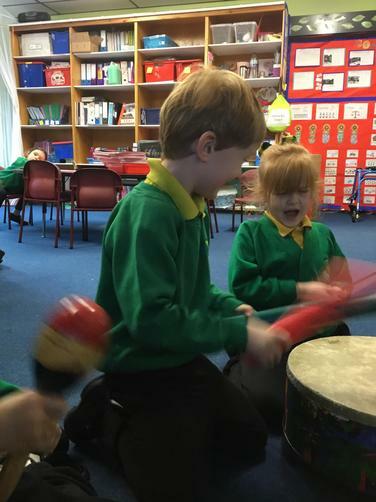 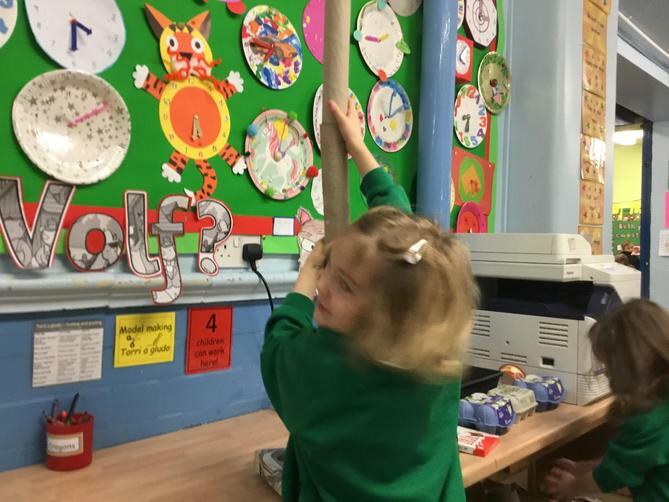 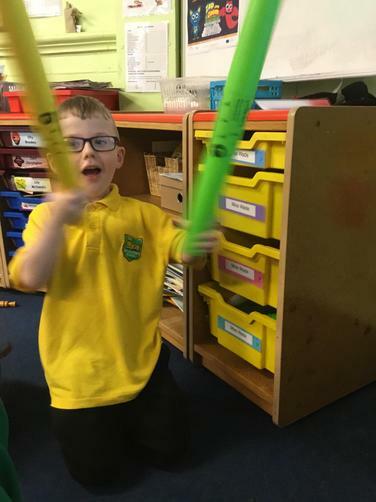 They did this so loud that Mr Williams came into our classroom from next door to find out what all the noise was about. 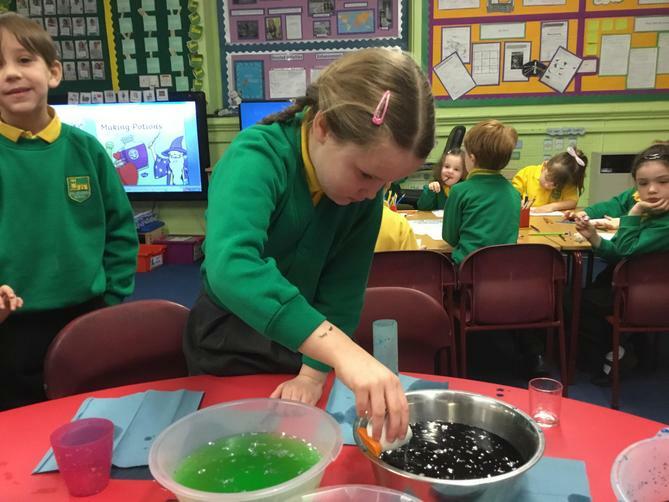 The children have been very creative and have made dream catchers and magic potions with Mrs Selby and these look great on our display. 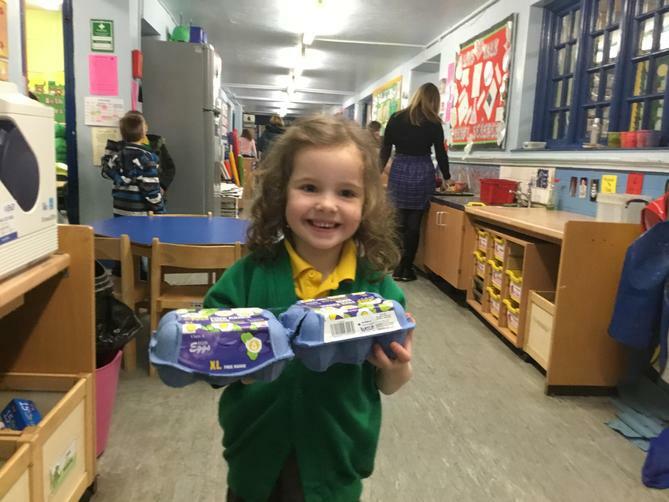 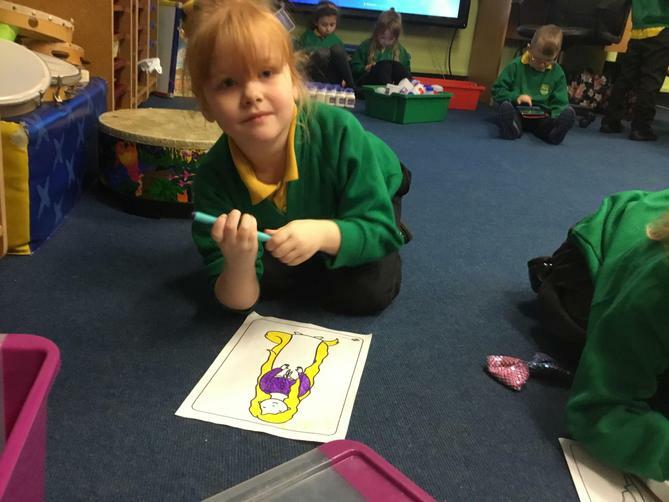 The children have really enjoyed the story this week and have made us very proud with all the hard work they have put into it. 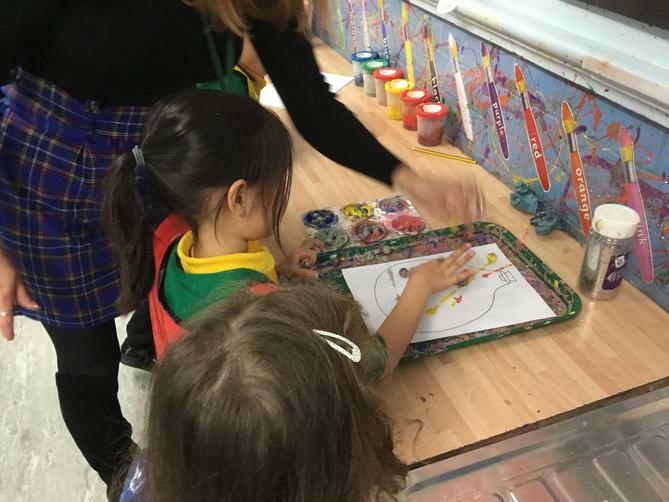 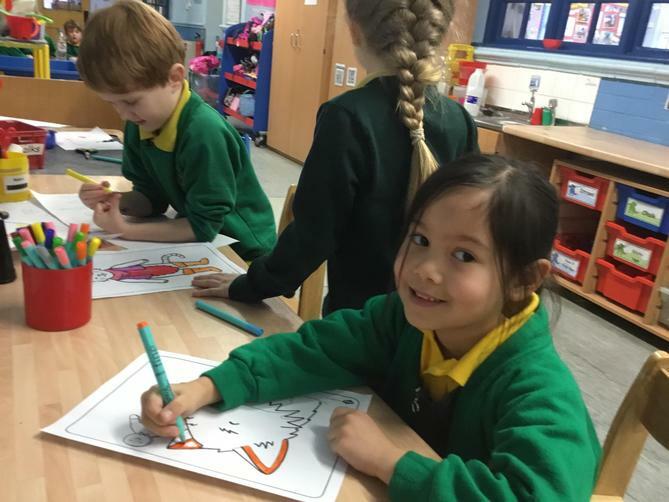 Next week we are learning a little bit about Chinese New Year. 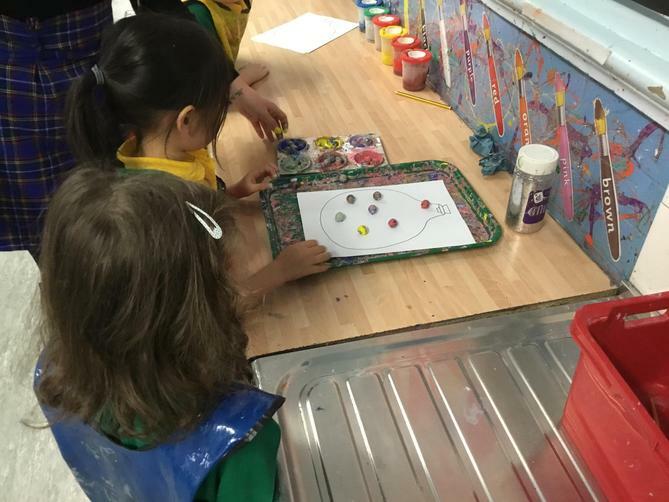 How they celebrate and where China is on a map. 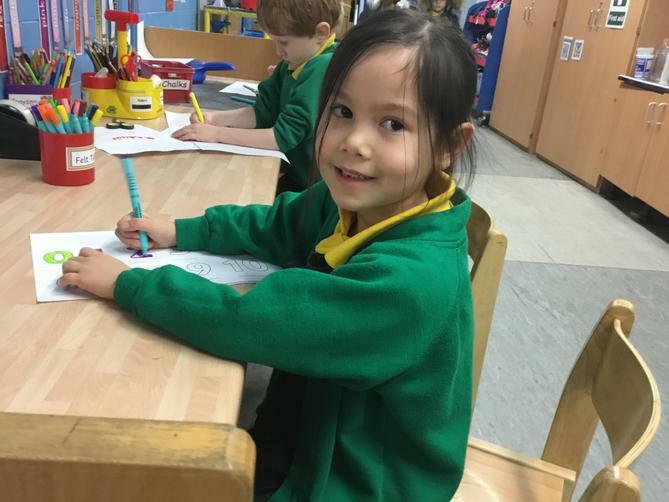 We will be listening to some stories and writing our own Chinese New Year wish. 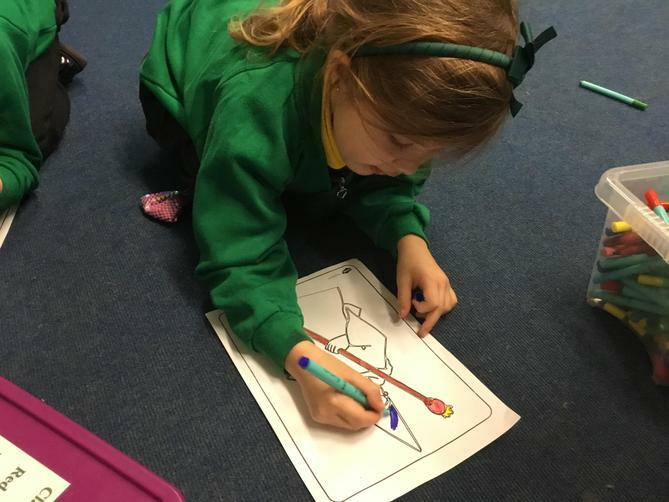 We will be making our own Chinese Dragon outside in forest school (if the weather cheers up a little). 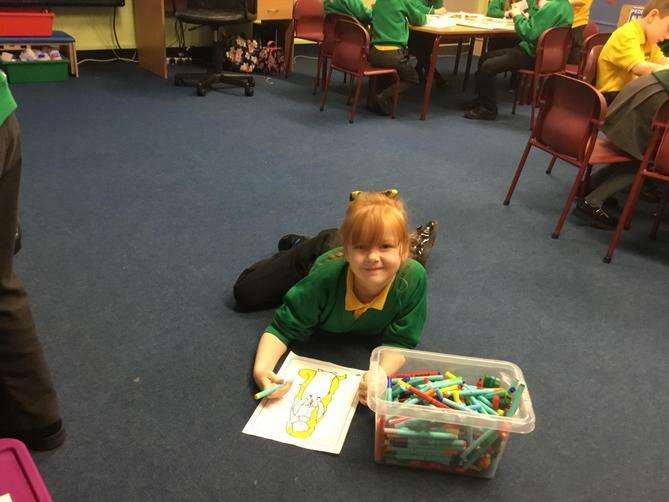 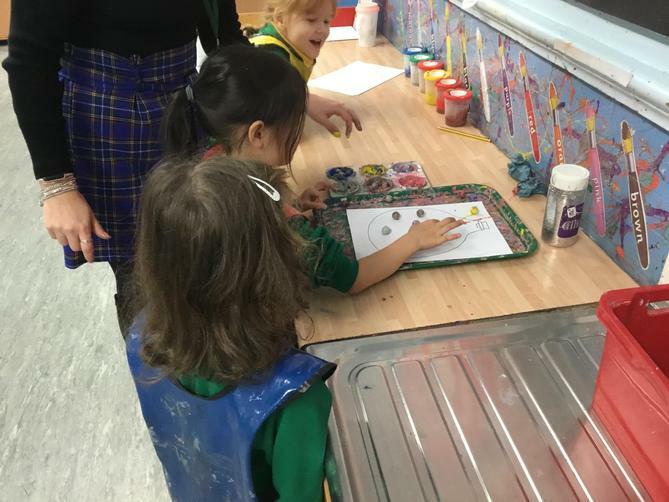 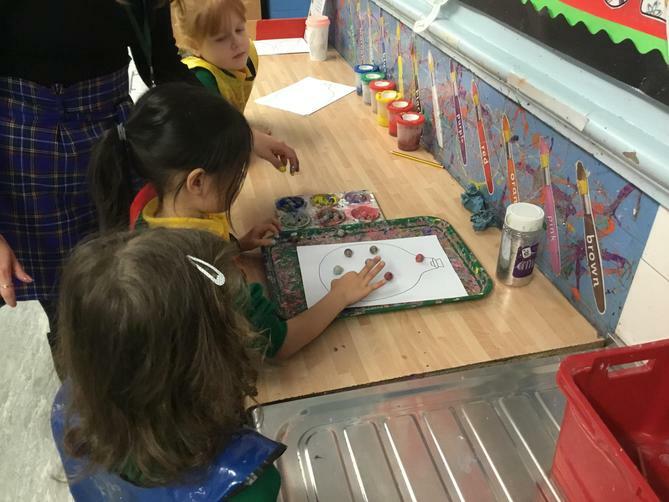 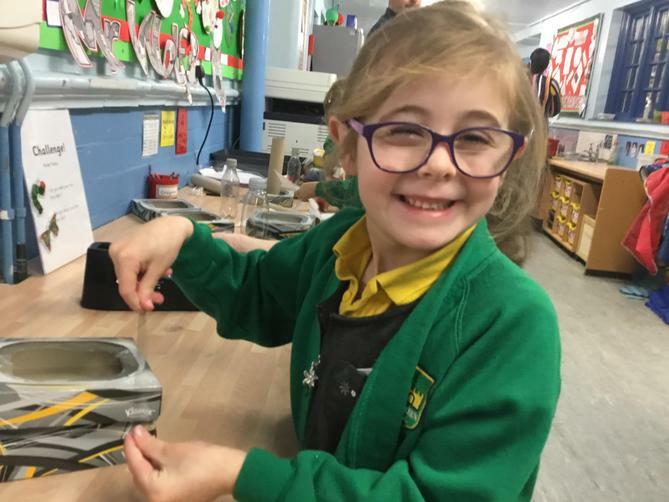 In language we will be making our very own fairy tale characters, we have done a lot of work towards this during the half term. 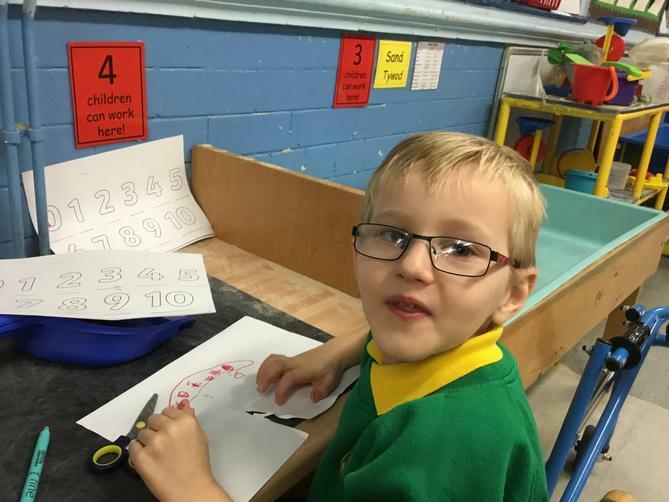 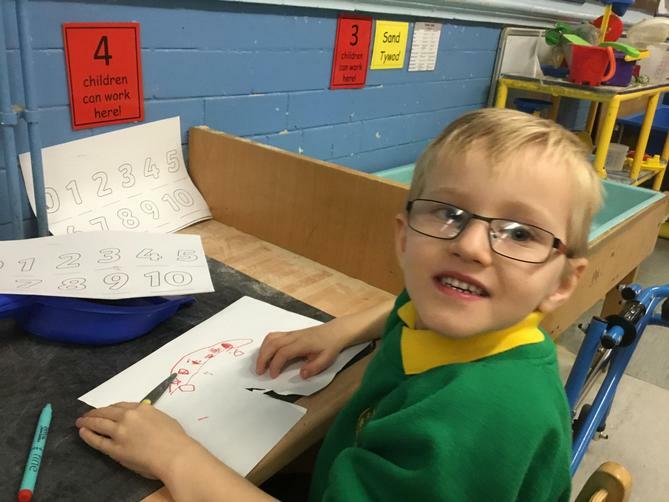 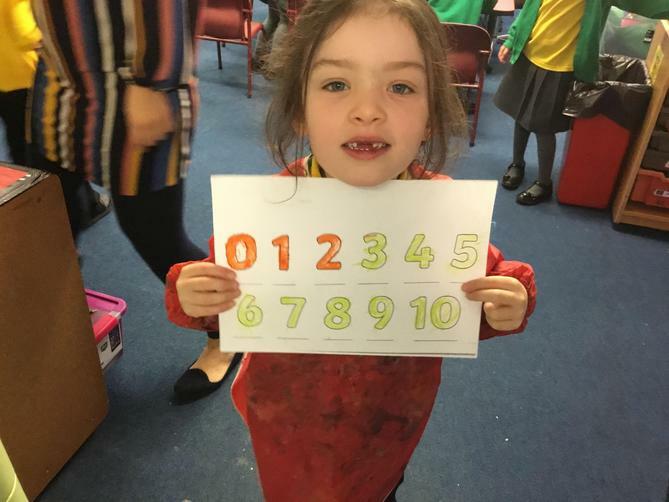 In maths we will be counting in 2's, 5's and 10's. 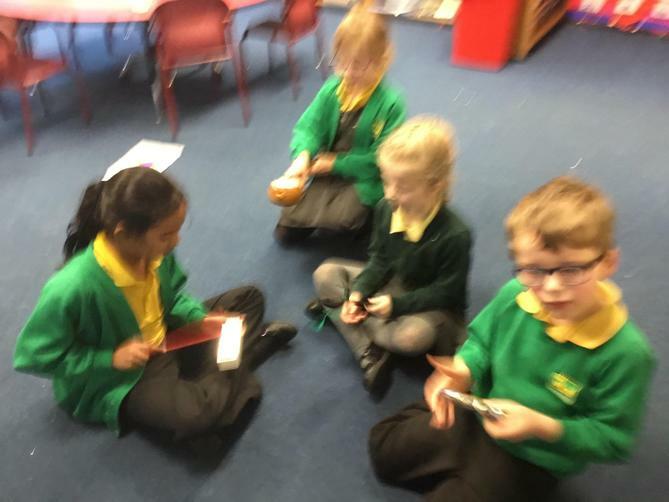 We will be singing songs, looking at patterns and using different games and resources.